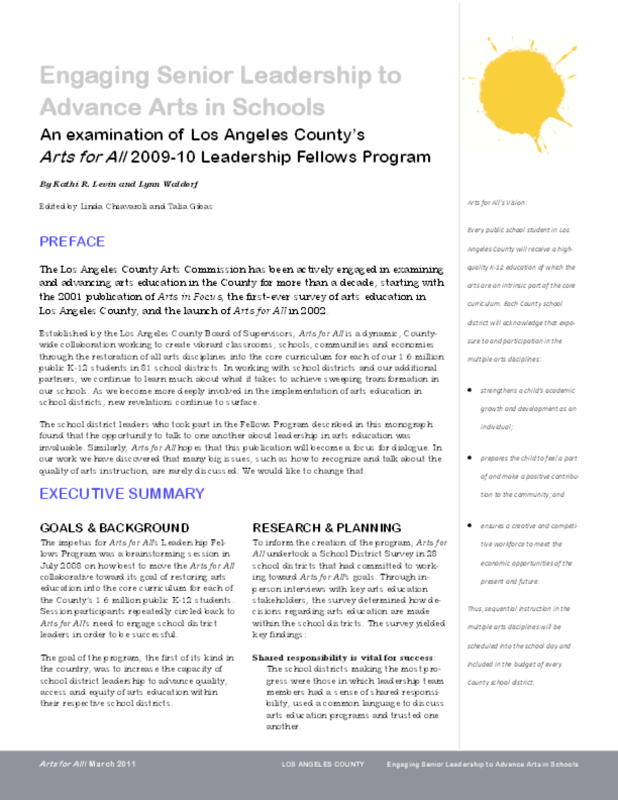 The impetus for Arts for All's Leadership Fellows Program was a brainstorming session in July 2008 on how best to move the Arts for Allcollaborative toward its goal of restoring arts education into the core curriculum for each of Los Angeles County's 1.6 million public K-12 students. Session participants repeatedly circled back to Arts for All's need to engage school district leaders in order to be successful. The goal of the program, the first of its kind in the country, was to increase the capacity of school district leadership to advance quality, access and equity of arts education within their respective school districts. 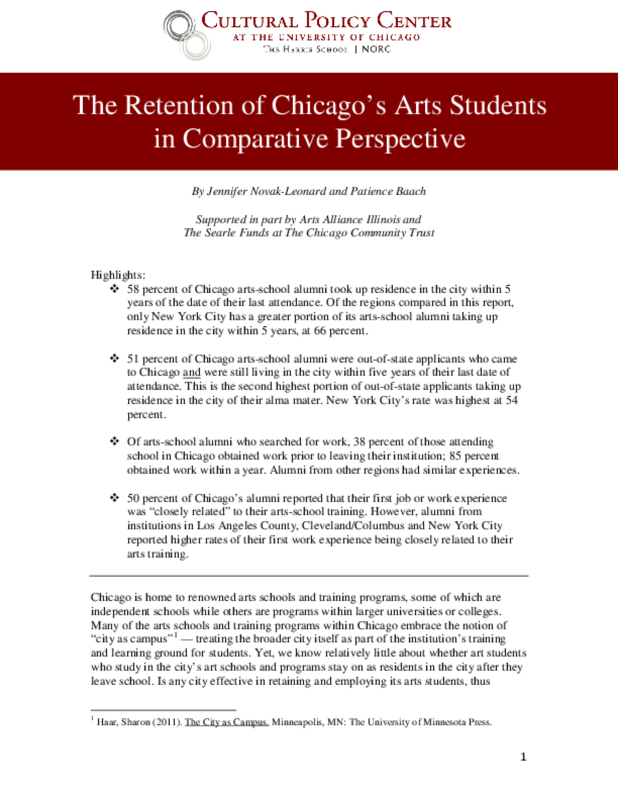 This report focuses on the work and results of the leadership fellows program in the 2009-2010 school year. As we enter the 21st century -- the global information age -- we must ensure our students are equipped to thrive in an environment that will require them to be able to shift their thinking and remain open to learning throughout their lives. Flexibility, innovation, improvisation and the ability to communicate across diverse cultures are skills crucial to future success. 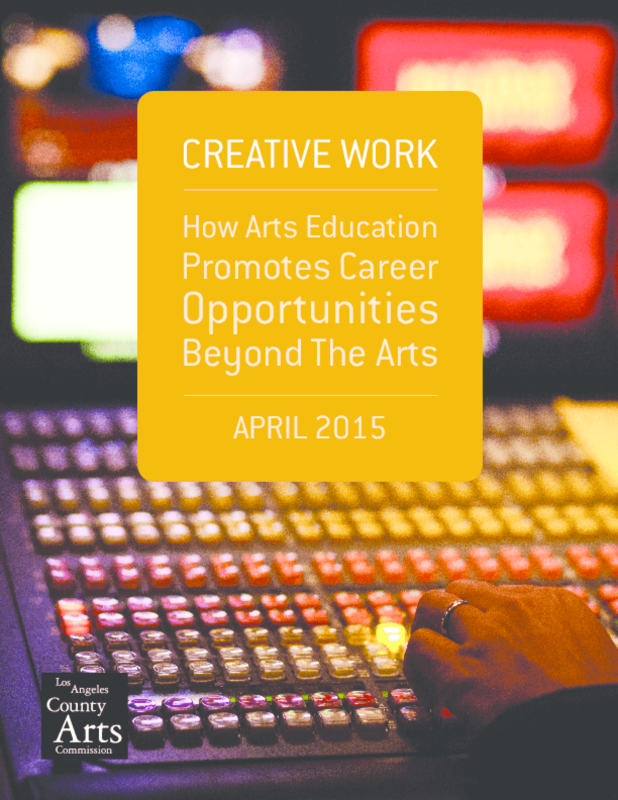 The arts are the most efficient way to teach those skills. By working to include and sustain the arts as part of a comprehensive K-12 curriculum, we allow students to cultivate the crucial skills they will need to function in a 21st century world. 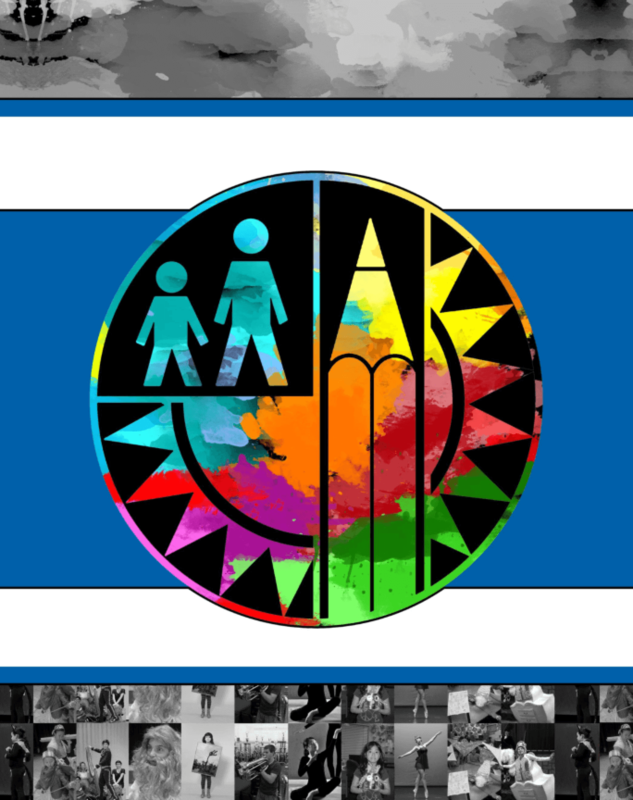 Arts for All is a dynamic, county-wide collaboration working to create vibrant classrooms, schools, communities and economies through the restoration of all arts disciplines into the core curriculum for each of our 1.7 million public K-12 students. One of the key strategies to ensure high quality arts education is to improve the quality of teaching and learning. We believe that when we help build the skills, knowledge, and confidence of the people who provide arts instruction to students, they are able to translate district policies and plans into high quality student learning. Practical tools and partnership opportunities promote the collective responsibility of classroom teachers, arts teachers, and artists to deliver high quality arts education. The on-going development of teachers and artists increases their ability to raise the quality of arts education. On Friday, May 7, 2010, Arts for All in partnership with California State University at Northridge, hosted the Arts for All Higher Education Think Tank. This event brought together decision makers throughout the education community to begin to discuss how to strategically address quality arts education in teacher preparation programs in order to impact teacher practice and student learning. Over 60 people attended representing 13 institutions of higher education, 3 foundations, 6 school districts and partners from the Los Angeles County Office of Education, Orange County Office of Education and the California Commission on Teacher Credentialing. This report is a transcript of those proceedings. 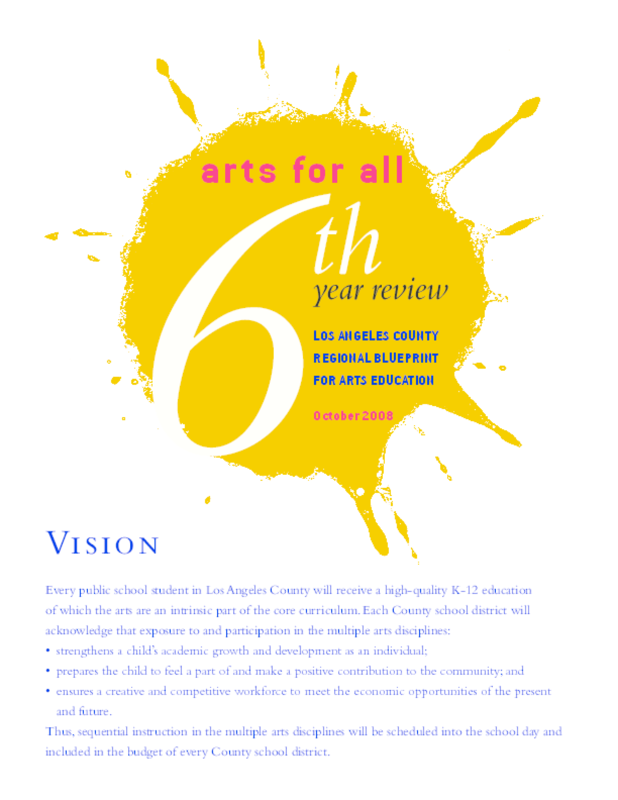 In September 2002, the Los Angeles County Board of Supervisors adopted Arts for All: Los Angeles County Regional Blueprint for Arts Education, a strategic plan to restore arts education -- in dance, music, theatre, and the visual arts -- to the 1.7 million students in Los Angeles County's 81 school districts. 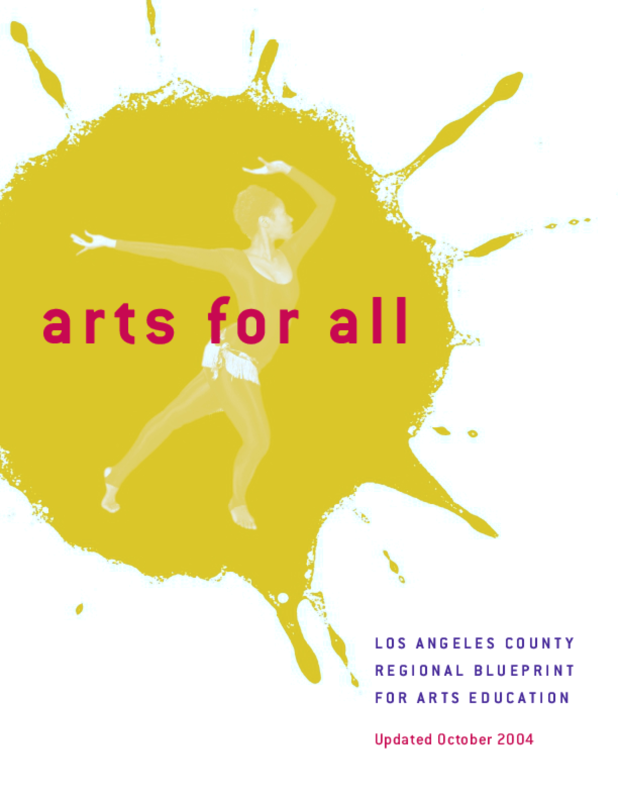 The Arts for All Executive Committee, with more than 100 partners and managed by the Los Angeles County Arts Commission, leads this effort. The initiative, having completed its sixth year, has made great strides. The mission of Arts for All: Los Angeles County Regional Blueprint for Arts Education is to establish sequential K-12 arts education in each of the 80 school districts in Los Angeles County and the Los Angeles County Office of Education (LACOE) classrooms.The Blueprint focuses on building an infrastructure to support districtwide education in dance, music, theatre and the visual arts. Progress is measured by five critical success factors. 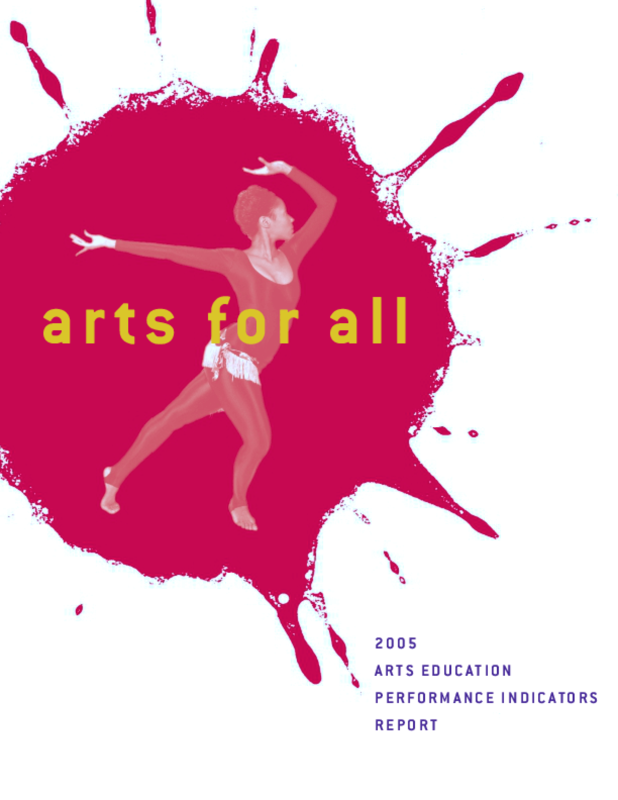 The data provided in this report gives a County-wide picture of the status of arts education with regard to five critical success factors in 2005.